The three pillars of sustainability: People (social sustainability), Planet (ecological sustainability) and Profit (economic sustainability) was a central point in this research. The People dimension in the transportation framework considers the wishes and needs of the stakeholders. It refers also to the quality, liveability and accessibility of the city. The Planet dimension refers to, amongst others, the reduction of CO2 emission and other greenhouse gases. Noise, spatial use and quality are also important planet themes for the transportation sector. Profit, or economic dimension, refers to sustainable traffic and transport system with lower social costs such as less environmental impact, less accidents and less traffic delays. This dimension also includes the economic vitality of cities and city centres. The research came up with several conclusions. Firstly, sustainability was mostly a window dressing in many mobility policies (that developed before 2010). Infrastructure development for private vehicles got a better priority. 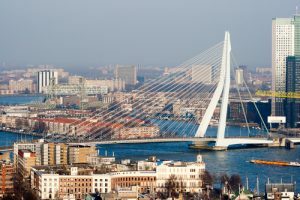 Secondly, the coherence among various transport plans and policies developed for Rotterdam and the surrounding cities (like The Hague, Leiden, and Dordrecht) was low. And thirdly, a sustainable mobility system could only be created when the system is prioritising non-motorised transport, public transport, and the integration of these transport modes. Would you like to know more detail about this project? Please do not hesitate to contact us. We would love to discuss it with you. *) This project was undertaken when Fadiah was working as a full-time consultant at Balancia.